Seven official Disney Springs hotels cover the range from basic and budget-friendly to expansive and expensive, with opportunities for guests to rack up and redeem rewards from hotel chain loyalty programs. Plus, they provide complimentary transportation to the theme parks, along with easy access to the area’s entertainment and shopping district. We’ve chosen our favorite Disney Springs hotels across several categories to help you decide which one is best for your family. While all of the Disney Springs Hotels offer theme park privileges, Hilton Orlando Lake Buena Vista has the advantage of being the closest hotel to the entrance of Disney Springs. It also has seven onsite restaurants, two pools and weekly character breakfasts. What more could you want? While few can compete with Disney’s hotels, many Disney Springs Hotels offer family-friendly pool features like zero-entry, splash zones and special pools just for children. 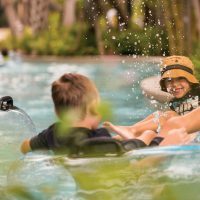 At Hilton Orlando Buena Vista Palace, guests can choose between a resort-style pool or a zero-entry lazy river with a Kid’s Splash Pad. Wyndham Lake Buena Vista Resort features the Oasis Aquatic Pool Playground, an expansive gradual-entry pool with interactive water features (cannon fight, anyone?) in a tropical setting. As we mentioned, Hilton Orlando Buena Vista Palace ranks high in the pool department, with a brand new resort-style pool, a zero-entry lazy river and a Kid’s Splash Pad. 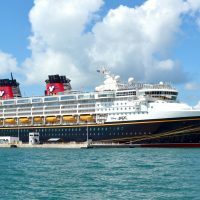 Plus, the resort offers a 24-hour arcade with more than 20 electronic games, a Disney Character Breakfast every Sunday at Letterpress, an Ice Cream parlor, and an Activity Lawn with family activities such as corn-hole set-up. Another favorite for family activities is Wyndham Lake Buena Vista Resort. In addition to an official Director of Fun and a Fun Center in the main lobby, the property rolls out the red carpet for families with beach volleyball, basketball and tennis courts, as well as the Oasis Aquatic Playground, a splash-happy pool area that’s very popular with children. If you like to trade pins, you’ll be happy to know that you can do so onsite — the hotel has a pin-trading book especially for guests. Plus, the resort offers an arcade with more than 20 electronic games, a popular Scoutabout self-guided scavenger hunt for kids, and plenty of pampering options for young royalty at the onsite Kay Casperon Lifestyle Spa. On Sundays at Watercress Cafe, the resort hosts a Disney character breakfast. DoubleTree Suites by Hilton Hotel Orlando – Disney Springs Area, an all-suite property, also offers more room than your average Disney Springs hotel, with 540-square-foot standard, one-bedroom suites, which sleep up to six, and even more spacious 850-square-foot, two-bedroom suites, which sleep up to eight. The best hotel to enjoy character breakfasts is based on frequency of opportunities to meet face-to-face with Disney characters at Wyndham Lake Buena Vista Resort, which offers meet-and-greet character breakfasts at the Lakeview Restaurant three times per week, on Tuesdays, Thursdays and Saturdays. Regulars include Goofy and Pluto. Daily charges like resort fees, internet access fees, fees for parking and in-room refrigerators can add anywhere from $10 to $45 per night to your regular room rate. Calculate this figure over the course of a week’s stay, and, in some cases, it’s comparable to the cost of a rental car. If you’re pinching pennies — and don’t like add-on charges — you’ll find a happy home base at the BEST WESTERN Lake Buena Vista. Rates at this property are typically less than $100 per night, and the only “add-on” is a $10 nightly resort fee. Also affordable is Holiday Inn Orlando – Disney Springs, with rates often listed at less than $100 per night. Better yet, it doesn’t charge any resort fees for all of its amenities, which include complimentary Wi-Fi, a game room, family rooms, an onsite restaurant and gift shop. Opened in 2014, B Resort & Spa is not only the newest hotel in Disney Springs, but also the most luxurious. Guests enjoy a stunning swimming pool and poolside cafe, onsite market, farm-to-table restaurant, kids’ zone, and rooms with bunk beds and gaming consoles and suites with kitchenettes. Guests also enjoy priority seating for Disney dinner shows and theme park restaurants, as well as preferred tee times at local golf courses.